Chinese editions of two of the four books from the “Maurice’s Valises” series by Jerry S. Friedman, translated by Yanhong and published by New Century Press have won the “2016 Bing Xin Children’s Literary Award”. The winning books were “In the Beginning” and “The Micetro of Moscow”. Celebrating the award, Lucy Weng, Vice President of New Century Press, observed: “If Xiao Wu’s two books “The Art of Storytelling 1” and “The Art of Storytelling 2” lay out a theoretical foundation for the importance of storytelling for children, then the “Maurice’s Valises” storybooks provide wonderfully practical examples of these theories brought to life in truly compelling children’s stories. Jerry S. Friedman, the American author of “Maurice’s Valises,” draws upon his vast experience traveling the globe to create an entire make-believe world for Maurice the mouse that children find utterly captivating. Xiao Wu has used her extraordinary penmanship and vast bilingual literary experience to creatively and sympathetically bring these books to life for children in China. The “Maurice’s Valises” series of books have already won numerous international literary prizes. Being awarded the “Bing Xin Children’s’ Literary Award” in China proves beyond a doubt that these adorable children’s stories, which are so rich in wisdom and warmth, have no borders and the gentle moral messages of empathy they impart are suitable for children all around the world,” she added. The Bing Xin Children’s Literary Award is named after the famous Chinese writer Bing Xin, whose work has made her a key figure in 20th-century Chinese literature. 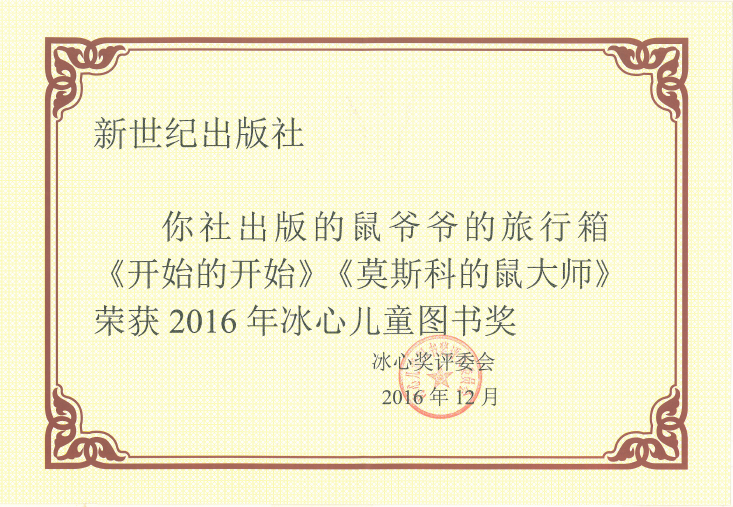 It is an annual award intended “to honor the creativity of Chinese Children’s literature, to discover and foster new authors and to support and encourage outstanding children’s literature and publishing.” The first series of awards were announced in 2005. Bing Xin’s daughter Wu Qing continues to be involved with the Bing Xin Children’s Literature Award.